In partnership with the Pershing Square Sohn Cancer Research Alliance, The Mark Foundation is pleased to announce that Dr. Benjamin Greenbaum has been named the 2018 Pershing Square Sohn Prize-Mark Foundation Fellow. This award will support Dr. Greenbaum’s research, in which he uses methods from math and physics to analyze highly complex data to understand better immunotherapy responses so that more patients can be successfully treated. Dr. Greenbaum is an Assistant Professor in the Departments of Medicine, Oncological Sciences, and Pathology at the Icahn School of Medicine at Mount Sinai, Tisch Cancer Institute. 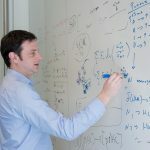 His research will use a new computational approach to modeling tumor-immune recognition to integrate information about the tumor and its environment into improved predictions of response to immunotherapy. “The prize will allow us to integrate our understandings of the roles of neoantigens in tumor evolution and responses to immunotherapy with our understanding of how a tumor’s environment shapes its evolution,” said Dr. Greenbaum. Learn more about Dr. Greenbaum’s Pershing Square Sohn-Mark Foundation Fellowship project here.